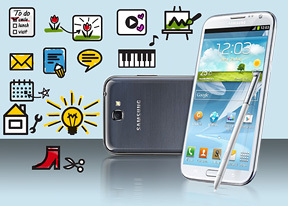 The original Galaxy Note's design was inspired by the Galaxy S II, the second iteration of the phablet takes after the current smartphone flagship - the Galaxy S III. And while many are less than impressed with the S III aesthetics, we have to say the rounded lines look great on the larger Galaxy Note II. The Samsung Galaxy Note II is actually a couple of millimeters narrower and 0.3mm slimmer than the original Note, which we found to benefit handling quite a lot. Even though its height has grown by nearly half a centimeter compared its predecessor, we generally found the Note II to be easier to manage. The front of the Galaxy Note II is dedicated almost entirely to the display. Since it and the S Pen are the most interesting hardware features, they will get their own chapters. The front does have quite a few interesting elements other than the screen. On top is the earpiece (as the Note II has full voice call support), with the 1.9MP front-facing camera and proximity sensor to the right. The ambient light sensor and the status LED are on the left side of the phablet. From the settings you can choose the types of events that light up the LED - charging and low battery, missed calls and during voice recording (only if the screen is off). You can add even more events or customize the colors for the preset events, but you'll need a suitable app from the Play Store or rely on the ever knowledgeable guys over at the XDA-developers' forum to come up with a tweak. Speaking of the ambient light sensor, we have to mention that the Samsung Galaxy Note II got the same treatment as the Galaxy S III before it and got a RGB sensor (i.e. one that's capable of detecting the full spectrum of the ambient light, rather than just its green channel. This leads to improved performance under some types of artificial lighting. Below the screen is the classic arrangement of physical hardware home key flanked by the capacitive Menu and Back keys. This setup has been in use since the early days of the Galaxy line and Samsung decided not to put the Android keys on-screen (as Google suggests) even on a screen this big. The Home key has a very soft press, but it's not unpleasant to use. The sides of the Note II hold no surprises either, a volume rocker on the left and a Power/Lock key on the right. The primary mic is at the bottom, exactly opposite the secondary one. The microUSB port handles charging and data connection with a computer. It's MHL-enabled, so you can output HD video through an HDMI adapter or enable USB Host via another adapter. The back of the phablet looks pretty barren - it houses an 8MP camera and a single-LED flash near the top and the loudspeaker near the bottom. The camera lens protrudes slightly, so the Note II rests on it when placed on a level surface, but judging from the original Note its hardened glass is not too easy to scratch. Samsung used the same hyperglazed plastic on the exterior of the Galaxy Note II as on the Galaxy S III. It comes in Marble White and Titanium Grey flavors, but if the S III is anything to go by, new color options should arrive in the following months. The back cover is removable and below it you'll find the beefy 3100mAh battery along with the microSIM and microSD card slots. The SIM card is blocked by the battery, so hot-swapping it is out of the question. There will be a flip cover for the Note II. It's the same as the one the original Note and the Galaxy S III got. It replaces the back cover and provides protection for the screen. The flap is made of leather. After using the Note II for a while, even the sizable S III feels small (the flagship smartphone being 1cm narrower than the phablet). The difference in screen size is quite notable too - we were quite reluctant to switch back to the smaller screen. However, this is not to say the Samsung Galaxy Note II is impossible to pocket - tight jeans might not make it feel at home, but with average or larger pockets it's entirely possible to carry it around like any other phone.